Pull everything out of each cabinet one by one and go through everything. Discard or donate* those things that are not frequently used, the duplicate or broken items, or things you forgot you had so never use. Do this with every cabinet and drawer, setting up separate areas on the table or countertop for each group. Be ruthless. Most kitchens are short on storage space, so the goal is to only have things you love and use. If you really cannot part with a couple of ‘special’ items, then put them away until you need them—or your next big sort-out! *If in doubt where to donate anything, please ask us. Almost everything is accepted—from mattresses to measuring cups. After your cabinets are all empty, consider what is best for you in terms of how to group items. Sort all your baking items and put them together. Sort your cooking items and put them together. Group your everyday dishes, then your holiday or other seasonal items that only get used once or twice a year, as well as those special entertaining or serving pieces that are only used occasionally. 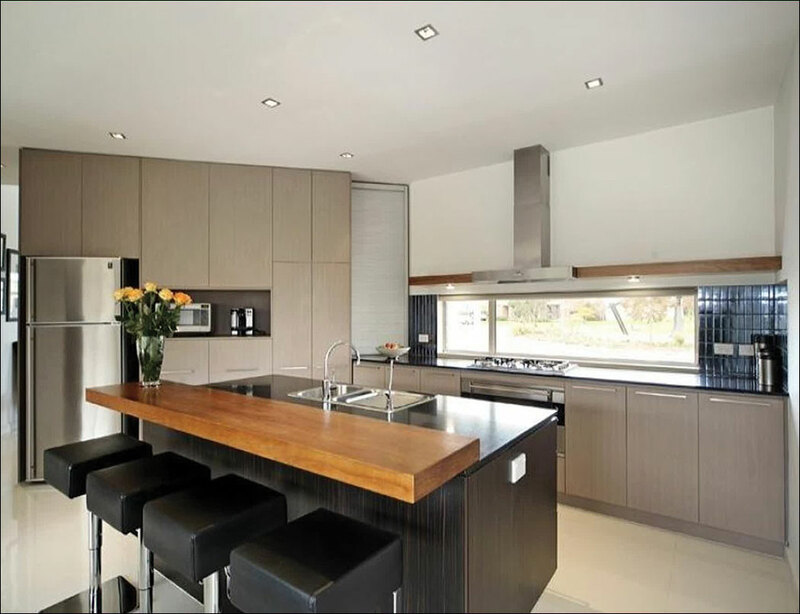 Now that you have groups laid out and separated, invest some time and energy into thinking about how you really use your kitchen. 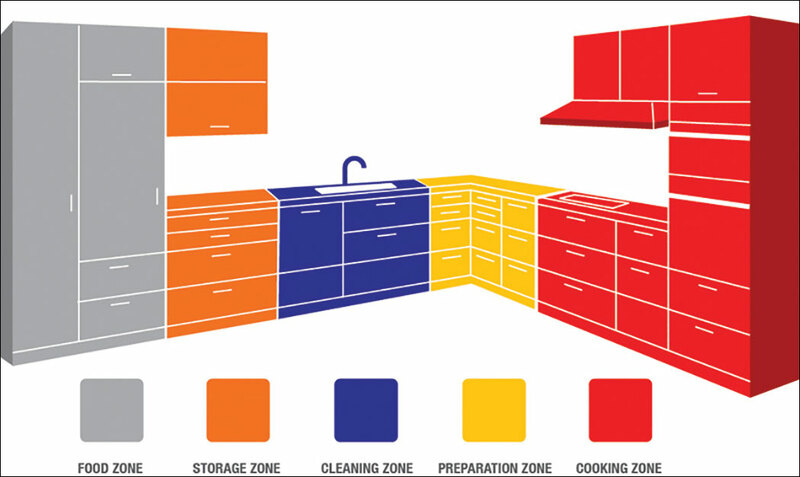 Think about if the typical organization zones are right for you, and where things should be stored in your kitchen. Usually the cooking and baking pieces should be kept close to where you do your food preparation. Your baking and food prep utensils should be in the drawer nearest to the prep area, and your cooking utensils by the stove. Pots and pans can be in that area too and close to the sink. Glassware might be best near the fridge, sink or dishwasher and your everyday dishes close to the dishwasher as well. Make a coffee or tea station that includes sugar, mugs and filters, and place it near the water source, if possible. This way you avoid going back and forth across the kitchen for the things you need just to make your morning beverage. 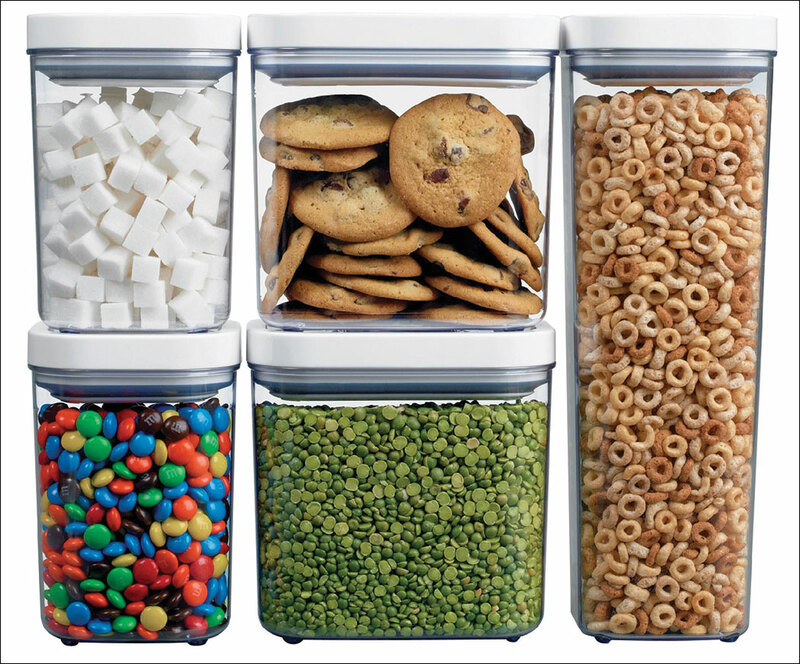 Use containers to organize the inside your cabinets and separate the sweet and the savory. Group things like packets of sauce mixes, gravy mixes, hot cereal packets, then put them into plastic containers to avoid them being scattered all over the cabinet. Discard any containers without lids, and store the remaining plastic containers either with the lids on them if space allows, or store the lids in another container and organize them by size and shape so they all stay together. Do the same with the lids for your pots and pans. A large clear plastic box will keep them nicely together and on their sides. Another option is to store them on their sides in a cabinet on a wire rack. Place hooks underneath cabinets to hold mugs above the counter top, or under shelves in the upper cabinets. Hang a stemware rack in the same way for your wine glasses. 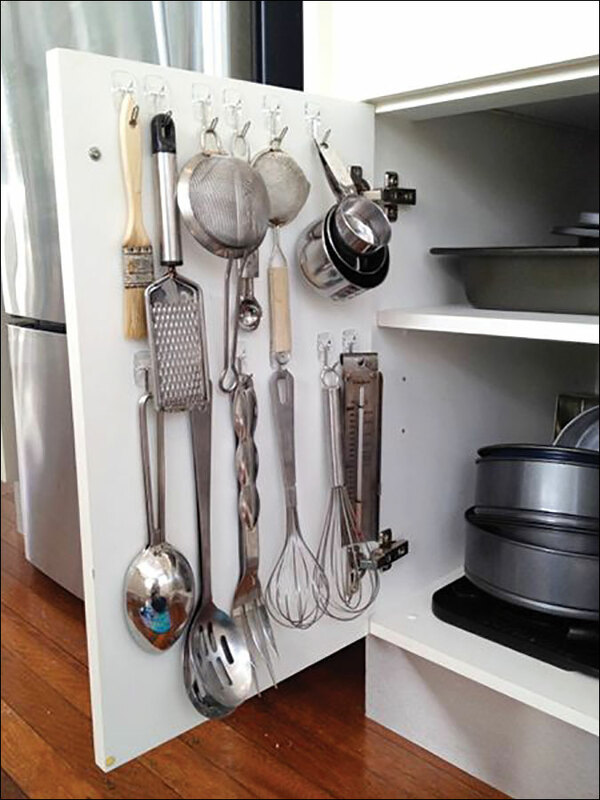 You can use the inside of cabinet or pantry doors for storing pot lids, measuring cups, kitchen gadgets and oven mitts. Mount office magazine holders flat to hold cutting boards or foil and cling wraps, and use shower organizers for kitchen gadgets, cleaning supplies or spices. Under sink storage can be maximized by adding tension curtain rods for hanging spray bottles, and free up shelf space below, and consider using wall space or a ceiling rack to hang pots and pans. Keep in mind that any space you can use to hang something up will free valuable horizontal space inside a cabinet. These small rotating trays can be used to hold things such as oils, vinegars and other cooking ingredients, as well as spices, vitamins or medications. You can also use a few lazy Susans in your refrigerator—one for beverages, so nothing ever hides in the back to spoil or freeze, and another for leftovers or small jars of pickles, olives or other small food items. Larger ones are useful in the corners of awkward base cabinets for your pots and pans, large mixing bowls or pantry supplies. Drawer dividers are great! Everyone needs a place to keep those little miscellaneous things, but they don’t have to be overflowing and junky. 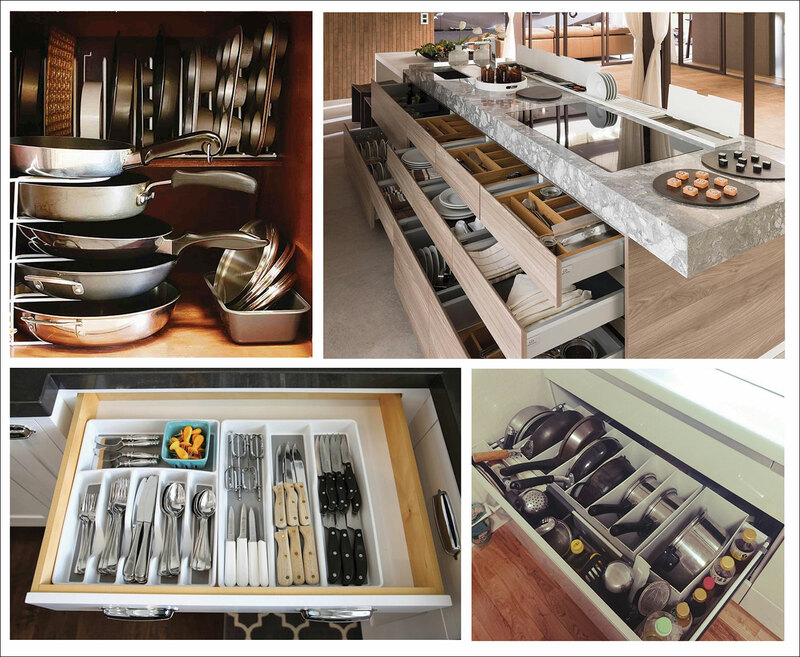 Drawer dividers will allow you to assign a spot for everything in your cooking utensil drawers, junk drawers and even pan drawers—and you’ll be able to find things when you need them. Get a magnetic sorter box to hang on the side of the refrigerator for take-out menus, business cards, a notepad pen or other papers that tend to accumulate on the countertops. Each type of paper should have its own section in the sorter. If you have a wood panel beside the fridge put it on there or even on the side of an upper cabinet. Keep papers together and out of the way. Keep bags near the garbage can, and throw a stack of loose ones into the bottom of the can, or attach them to the outside. That way, when you pull out one bag, there is already another one waiting to be used. If you put your garbage out once a week, use that time to clean out your refrigerator each week too. See what food needs to be pitched and immediately throw it out, and take the trash out right then. Your refrigerator will house only current items and will be less cluttered—and it only takes a few minutes if done regularly. Your personal work style will determine where you store and use the items in your kitchen, but the goal is to get that space and its contents to serve your needs as smoothly and efficiently as possible. Anyone who knows me knows that I do not particularly enjoy cooking, however I must admit I enjoyed making—and eating—our Thanksgiving Dinner!